Similar to all lenders, the FHA has certain requirements that must be met to be considered eligible for a mortgage insured by them. Unlike many conventional loans, however, FHA loans have less stringent requirements for borrowers to meet in order to qualify. Whereas many lenders ask for a 20-percent down payment, you don’t need a huge upfront payment for a government backed mortgage. The FHA needs a down payment 3.5% of the purchase price. 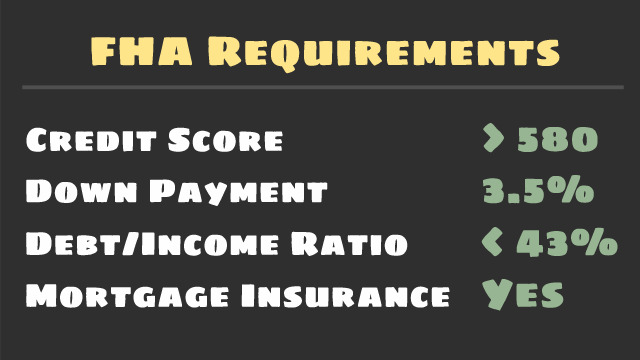 Even your credit score isn’t a huge focus for the FHA; you need a score of 580 or higher, but if your credit history shows that you make your payments on time, it’s likely that your loan application will be approved. Despite its lenient eligibility guidelines, the FHA is ultimately an insurer of loans, so the agency will try to confirm that the borrower does not get into a mortgage that he/she cannot afford. Therefore the debt-to-income ratio is considered before you are granted a loan. The highest ratio allowed by the FHA is 43 percent. The FHA operates solely from its own generated revenue, not any federal taxes. To be able to insure lenders, the agency mandates that borrowers pay FHA funding fees, in the form of mortgage insurance premiums.